When? On February 14, beginning at 19:30 p.m.
We are pleased to invite you to our upcoming event that we organize together with the Mouvement Ecologique: the Vegan Valentine. Come and celebrate with us, bring your friends, lovers or both! What to expect from this event? 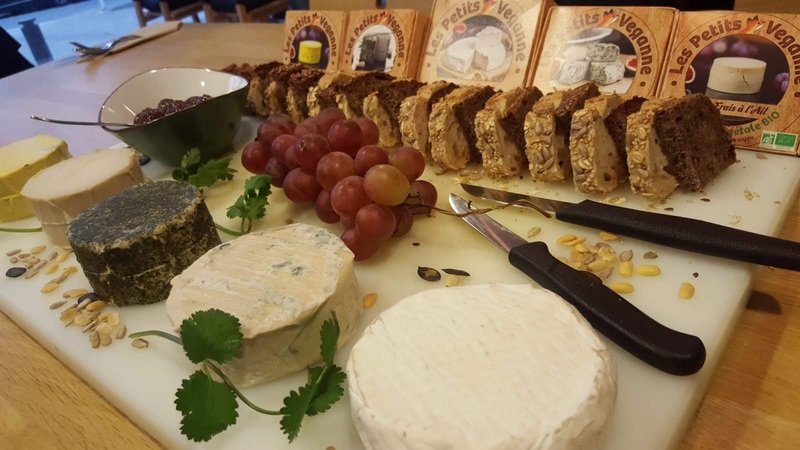 A wonderful cozy evening; an assortment of exquisite organic vegan “cheeses” and other colorful side dishes (grapes, nuts, figs jam, …); a yummy dessert (coconut cream with raspberry puree and almonds); delicious vegan wine. Besides of stimulating your taste buds, the President of the VSL “Earthling Daniel” will indulge you ear together with a charming external lady from Germany “Morrigan” with beautiful piano music. To subscribe for this event, please transfer the corresponding amount (25 EUR for 1 person, 50 EUR for 2 persons, etc.) to our bank account IBAN LU60 0019 4355 2831 7000 by indicating “Vegan Valentine_ your name” and send us a short text via e-mail (contact@vsl.lu). A confirmation email will be sent when de payment is received and the reservation validated. Since our last event was rapidly sold out, we encourage you to register as soon as possible, first come, first served (date of the bank transfer). We are very much looking forward to welcome you at this event! 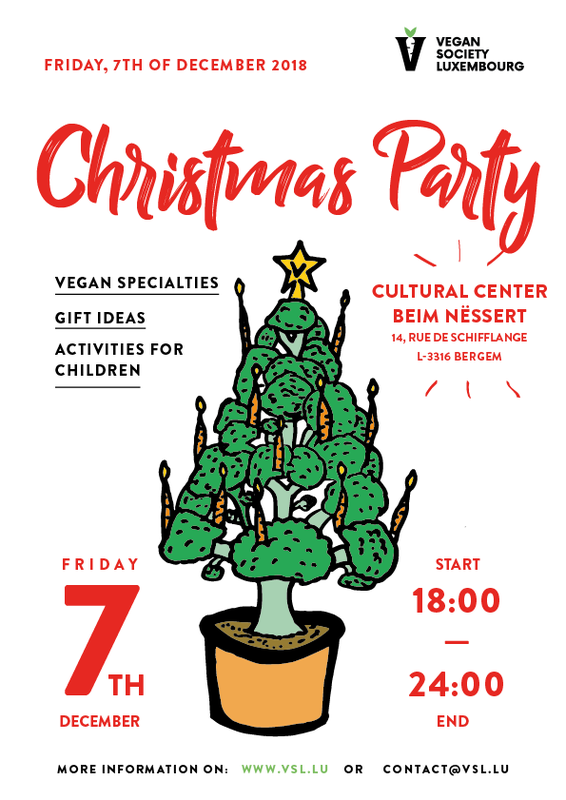 We kindly invite you to attend our next event, the traditional VSL Christmas Party, taking place on friday, 7th of december 2018 from 6pm at the centre culturel „Beim Nëssert“ in Bergem (adress: 14, rue de Schifflange, L-3316 Bergem). You‘ll also find present ideas for Christmas and we organize some activities for children as well. Here‘s the facebook of the event, don‘t hesitate to invite your family and friends, everyone is welcome, no matter if vegan, in transition, or just curious. The committee of the Vegan Society Luxembourg. Purpose of the association is, through education, imparting expertise and good example, the promotion of veganism; this includes the vegan diet as well as a vegan lifestyle.